Former President Mahinda Rajapaksa today said that he didn’t believe that the Cabinet Ministers would have any links with the RAW (Research and Analysis Wing) of India. 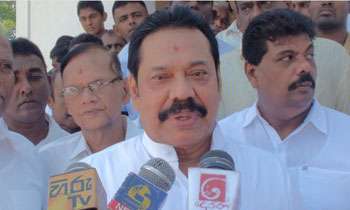 Responding to journalists after visiting the Henakaduwa Temple at Tangalle, Mr Rajapaksa, however, said the act of one of the Ministers working for the RAW would amount to treason. “The Government always creates a mess. It is hard to say that there are Ministers with affiliations to the RAW. What a slap in the face to M. Amaraweera and the SLFP. Good for the fellows. What MR has said is not what he believes in his heart. You are very gullible. Who believes in a TWO tounge mouth piece. The fear of India is shaking even strong characters like Mahinda Rajapaksa. Did you make this statement after visiting the corporate boxes at sooriyawewa stadium? Even we are not believe and trust you, your brothers and thieves who are around you. u wont beokievd since the same double crossers feed youl also like susil, etc. Malik samarawickreme is the RAW agent.He collected over US $ 2m b4 the elections.